Today Atlantic Natural Foods, based in Nashville, North Carolina, announced it has bought the Loma Linda and Worthington brands of canned meat analog products, including FriChick, Choplets, Super-Links, Big Franks and Tender Bits. The Kellogg Company, based in Battle Creek, Michigan, had owned these meat alternative brands since it acquired Worthington Foods in Ohio in 1999. For Kellogg — the maker of Corn Flakes, Special K, Rice Krispies, Nutri-Grain Bars, Eggo and Pop Tarts — the business of fake meat in a can was a minor one. Krause, who eats meat only occasionally herself, has no Adventist connection. She was named CEO of Atlantic Natural Foods, with 95 employees, last March. Atlantic Natural Foods has been manufacturing the Worthington and Loma Linda canned foods since 2008, under license. Recently the company approached Kellogg about buying the brands, as well as the Kaffree Roma alternative coffee brand, outright. “It started out almost as joking,” Krause said. Krause said that the Kellogg Company was always a great partner to work with, but since the iconic “Adventist” brands were such a small business unit within a much larger company, they just weren’t getting the support they deserved. Sales were declining. Atlantic Natural Foods had introduced two new meat substitute brands into its product line — Meatless Select and Caroline’s — which complemented the Worthington and Loma Linda brands. The company, with Krause at its helm, felt there was real opportunity in the meat analog market. After approaching Kellogg about buying the products (and no one will share specific numbers or dollar amounts), everything happened very quickly. Within 30 days, the contracts were signed. Kellogg kept its frozen foods in the deal, including the widely-recognized MorningStar Farms brand. Krause is excited about finding ways to revitalize the brands — and she says the company will be deliberate about focusing on its core market of Adventists. As part of her work, Krause has visited a California campmeeting and an ASI (Adventist-laymen’s Services and Industries) convention. She even attended the 2010 General Conference Session in Atlanta, Georgia. She says her company wants to “reconnect with the customer through the church” and “bring back the excitement.” Atlantic Natural Foods intends to “do some of the things that made these products a success years ago.” They are in the initial stages of strategizing with an advertising agency, but community events and innovative marketing are being discussed. The company wants to introduce new products and try to find ways to make the old ones more exciting. The company’s main focus is the United States, but they are also in the Caribbean, and exploring the Canadian and South African markets. Krause was intrigued by many of the people she met at the GC and elsewhere, who wanted the products to be accessible in other parts of the world. With a shelf life of three years, Little Links and Vege-Burger might be able to make the jump. She notes the studies showing that Adventists tend to live longer, and then says that for people with dietary restrictions — or just for the large segment of the population who want to eat less meat — these foods are an affordable alternative. The Loma Linda and Worthington brands are a very small slice of the American health food market. But Adventists got into the food business early. After all, Kellogg Company, was started by brothers Will Keith Kellogg and John Harvey Kellogg, a noted member of the Adventist church for much of his life, who was greatly influenced by Ellen G. White’s health message. Worthington Foods ended up becoming a company with a sales volume of more than $200 million and 500 employees. And Sanitarium Health & Wellbeing in Australia, maker of the country’s most popular breakfast cereal, Weet-bix, is one of Australia’s largest food manufacturers — and wholly owned by the Adventist church. While the sales of Vege-links and Big Franks may be declining now, Krause sees big potential in meat substitutes. Watch this space. Please, please, Ms. Krause, bring back Nuteena, the beloved peanut pâté! I remember it, I liked it too. Interesting move. The CEO obviously has a flair for understanding the market, which will help her company extract profits out of Adventists, in return for providing Adventists with what they want. They will need to deal with all of the artificial colouring and E-numbers that make their products prohibited in Europe, if they want to go international. We appealed to Kellogg, to improve healthful naturalness, but they insisted that creating meat analogs for the American market was more important to them. This may satisfy Animal Rights - vegetarians, but does nothing for those who want simple healthful food. I think they have not sufficiently dealt with the fact that even Adventists have become health aware enough to beware of meat analogues, realizing that the manufacturing process, the additives, as well as the basic problems with gluten intolerance on which almost all products are based, which has led at least in part to the decline in the Adventist “market”. Now if they would concentrate on making them truly HEALTHY foods and not only bring back, but create new products that were made from RECIPES rather than from manufactured and chemical junk… then I, for one, and I’m sure many other SDAs, would start buying some of them again. 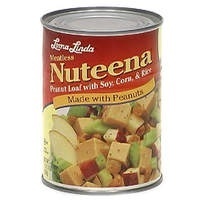 The nuteena, already mentioned, is one such product… as are some of the older Madison foods products… though one has to be REALLY old in order to even remember them. I think of once called “soy cheese” which was probably similar to today’s tofu products, but more crumbly… like cottage cheese, and slightly flavored with pimento… which made a very tasty sandwich spread. Maybe the “European Market” restrictions will have more influence with Ms Krause than it did with either the Worthington or Kellogg companies. When I was at Madison, prior to entering the Nursing program, I sometimes was asked to help out in the Sanitarium kitchen on Friday afternoons [my day off from the bakery, in same bldg as Madison Foods]. This one afternoon they were taking pictures of the product ComPro in 3 stuffed tomatoes for the label. It was my pleasure to have one after the shots were completed. I also got to meet Dr Harry Miller [of China fame]. He conducted our morning worship for several days and used our bakery mixer, helping to develop some new products for Madison Foods. It was my understanding that Worthington bought the rights to Madison Foods recipes when Madison Foods closed. Here in Macon all of the Krogers have a huge section for “natural foods”. There are a number of brands of vege meats in the coolers and freezers. Morning Star has only a small % of the room. A fake religion creates a fake meat (food). In the non-Adventist health conscious vegetarian community, there is not a market for the fake meat. It is reported that soy products along with plastics contain “xenestrogen,” a compound that imitates the effects of estrogen, believed to fuel obesity and prostate enlargement. In the non-Adventist health conscious vegetarian community, there is not a market for the fake meat. Truman, I have to disagree, just go to Whole Foods, or trader Joe’s, let alone many other large chains that have dded significant “health food” sections. I actually like some of the other brands better than Worthington, but that is my personal taste. All my family loved Nuteena. But I buy the frozen analogs made by Morningstar and many other companies are making excellent meat substitutes: Trade Joe’s is a favorite with their “meat balls” and Gardein makes great chicken tenders, also. Perhaps Trader Joe’s is not yet in all the states but it is a “must” for at least a weekly visit just to see what new they have. Their prices are much lower, their packaged ready to cook greens, all sorts of salad mixes and they carry a host of vegetarian entrees, pizzas and fresh varieties of breads. Their sprouted rye bread has been my favorite for years now. We as a church let go of a massive opportunity. We should be the head and not the tail when it comes to this industry. This industry alone, with God’s blessing, would have paid in full many student’s tuition for school. That’s what the purpose of industry in the church was for. And upon graduating no one would be in massive debt. We’re reaping what we’ve sown. The church, for the most part, is not that health conscience, esp. when it comes to diet. Just look at many of our leaders and ministers. As Jan Marcussen used to say, many Adventists can hide many of their sins but there is one that they cannot hide - their pot belly. I really like Trader Joe’s and not only are the products good, they are pretty generous as a company. I was the director of a thanksgiving basket program at a previous location and they gave us grocery bags (A couple of of Bundles of 250 each) for part of the packages we handed out. We had a big project and a generous church family and helped out about 10 families each thanksgiving, 95 percent community members with no church affiliation. No, but she’s, essentially, overseeing the pot-luck, so they may let her slide. From a vege-meat marketing perspective, that last sentence is called “small print”!